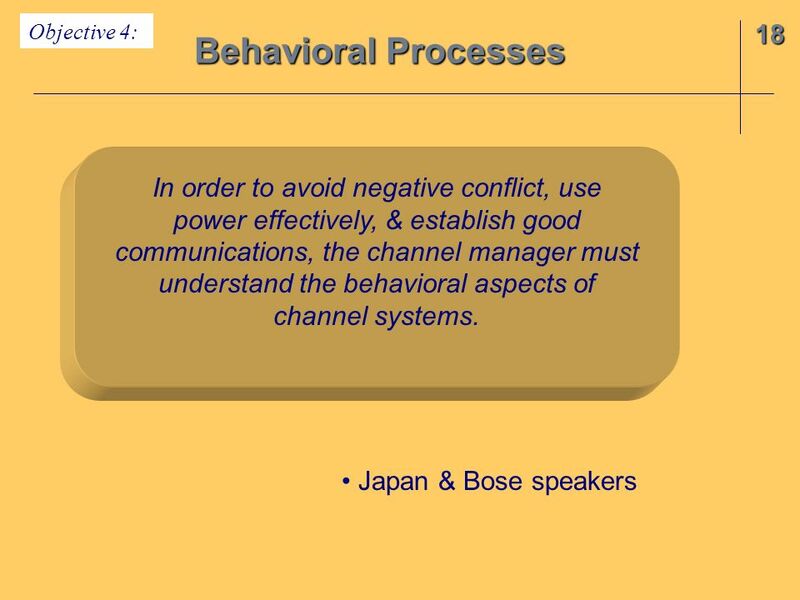 Chapter 18 International Channel Perspectives. 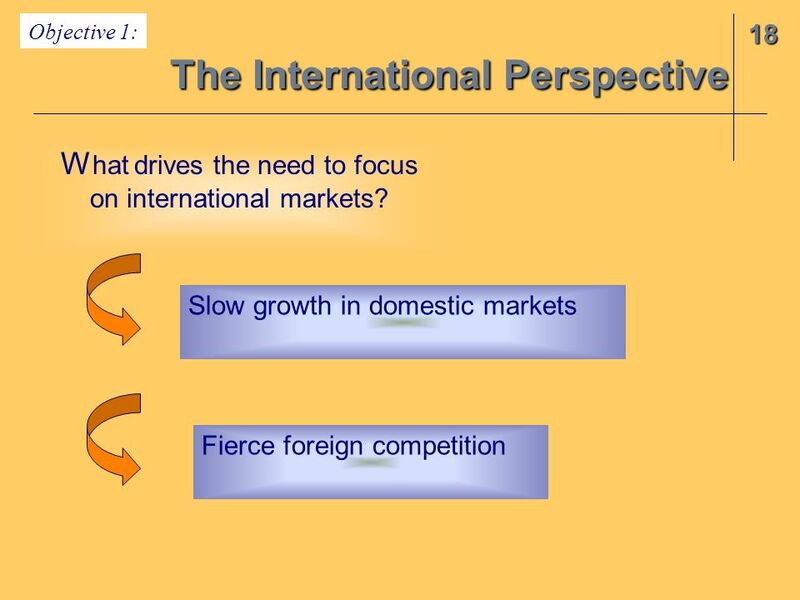 The International Perspective 18 Objective 1: W hat drives the need to focus on international markets? 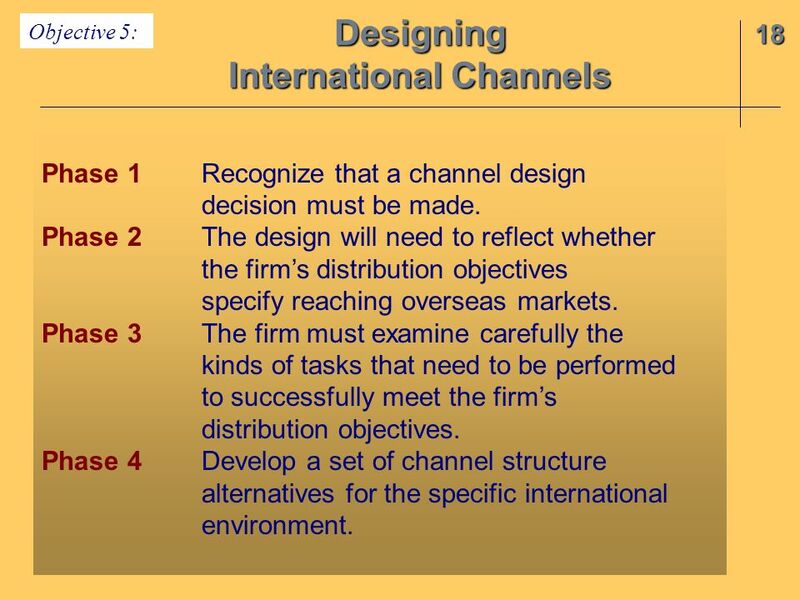 11 18 Designing International Channels Objective 5: Phase 1Recognize that a channel design decision must be made. 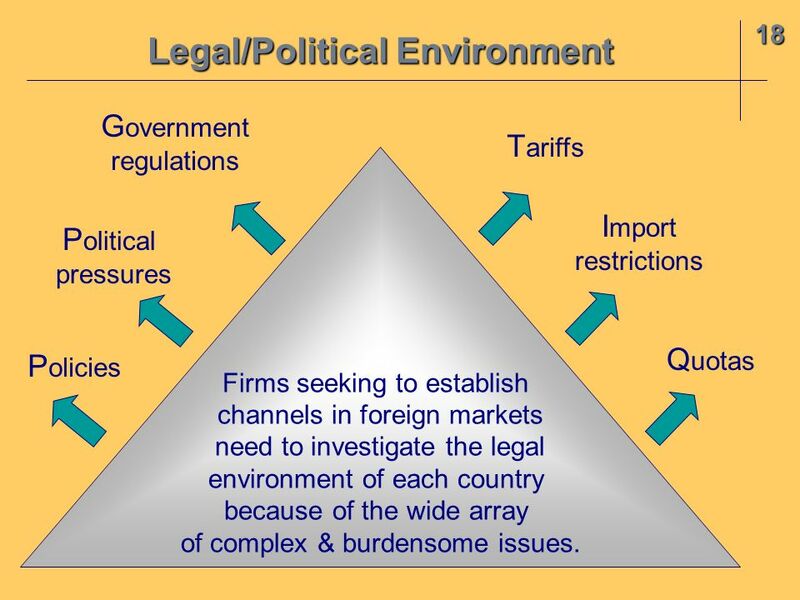 Phase 2The design will need to reflect whether the firms distribution objectives specify reaching overseas markets. Phase 3The firm must examine carefully the kinds of tasks that need to be performed to successfully meet the firms distribution objectives. 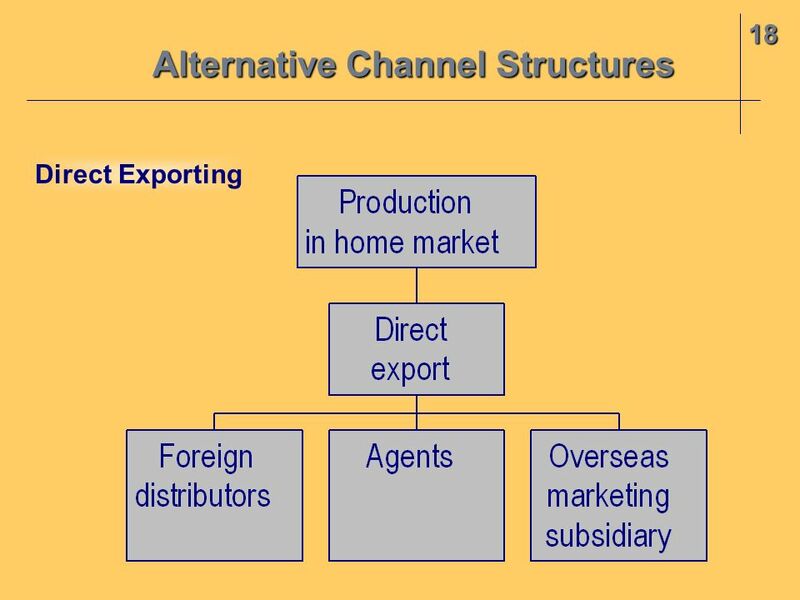 Phase 4Develop a set of channel structure alternatives for the specific international environment. 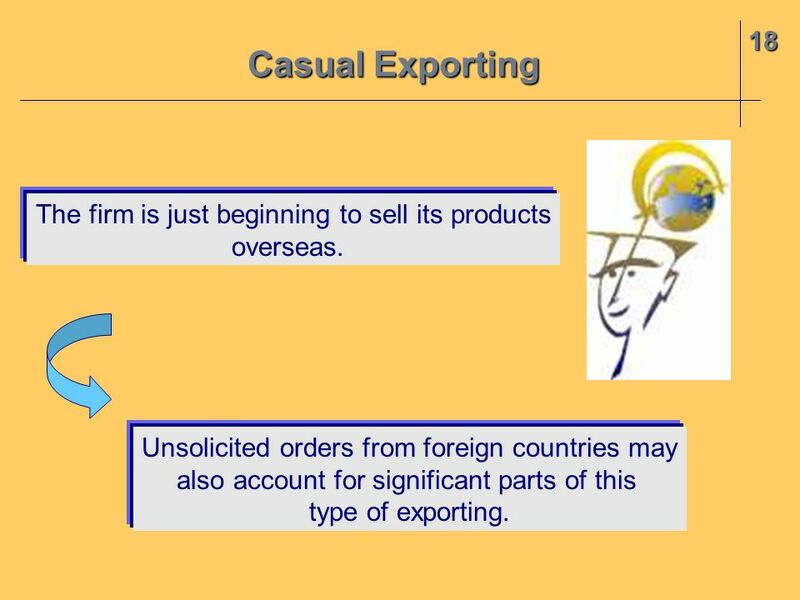 13 18 Casual Exporting The firm is just beginning to sell its products overseas. 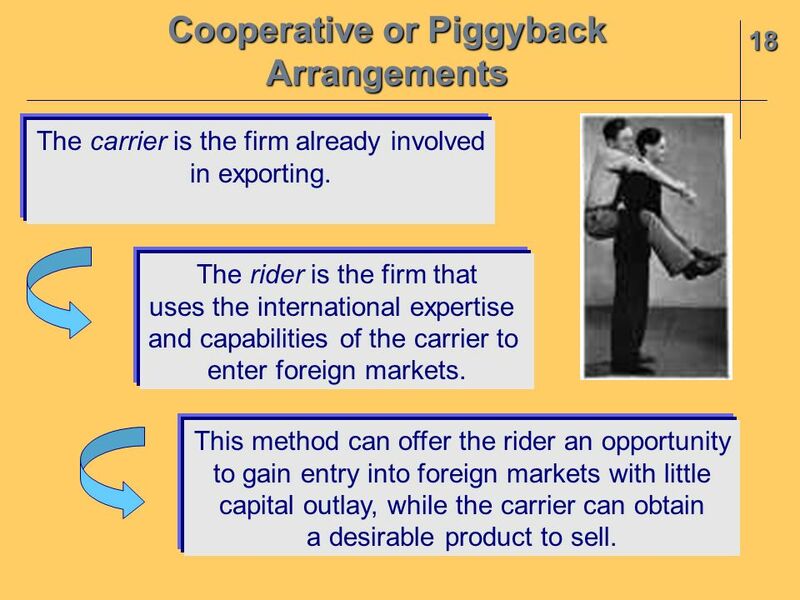 Unsolicited orders from foreign countries may also account for significant parts of this type of exporting. 19 18 They are independent, but they do not take title to, and usually do not take physical possession of, the products they represent. 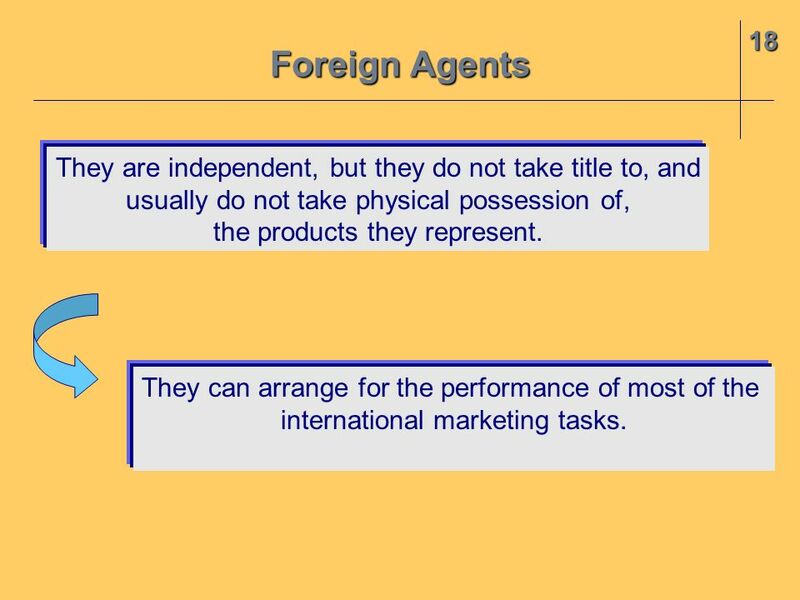 Foreign Agents They can arrange for the performance of most of the international marketing tasks. 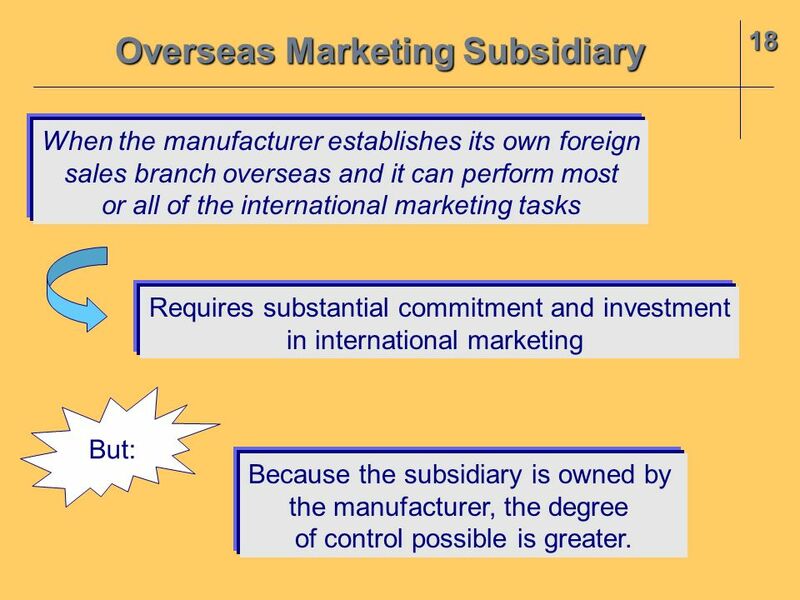 20 18 When the manufacturer establishes its own foreign sales branch overseas and it can perform most or all of the international marketing tasks Requires substantial commitment and investment in international marketing Overseas Marketing Subsidiary But: Because the subsidiary is owned by the manufacturer, the degree of control possible is greater. 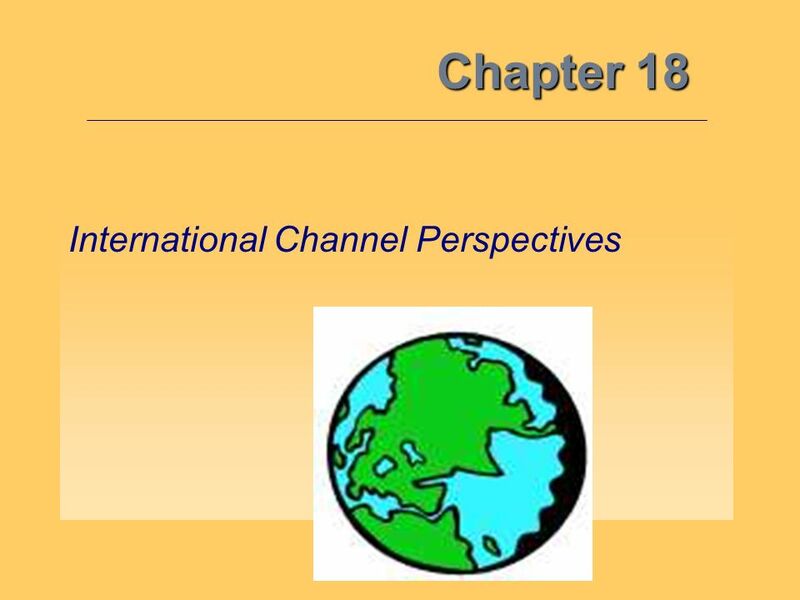 Download ppt "Chapter 18 International Channel Perspectives. 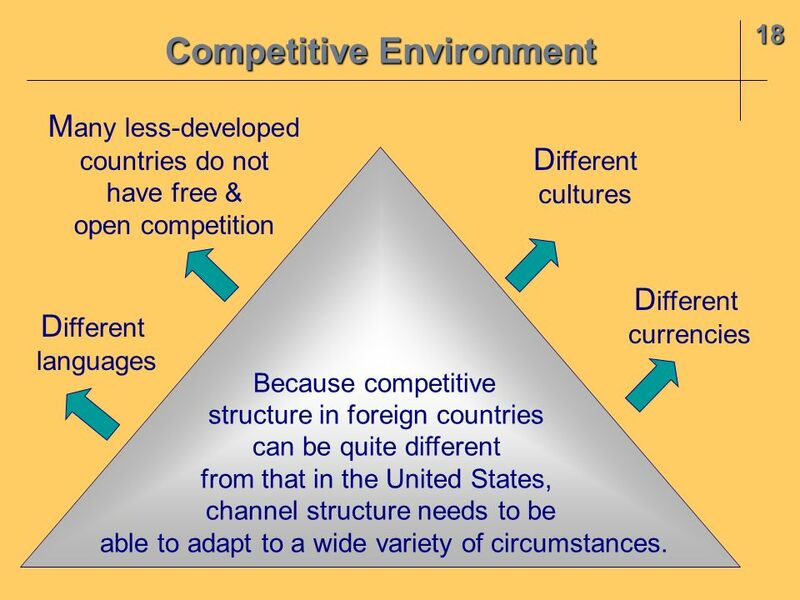 The International Perspective 18 Objective 1: W hat drives the need to focus on international markets?" 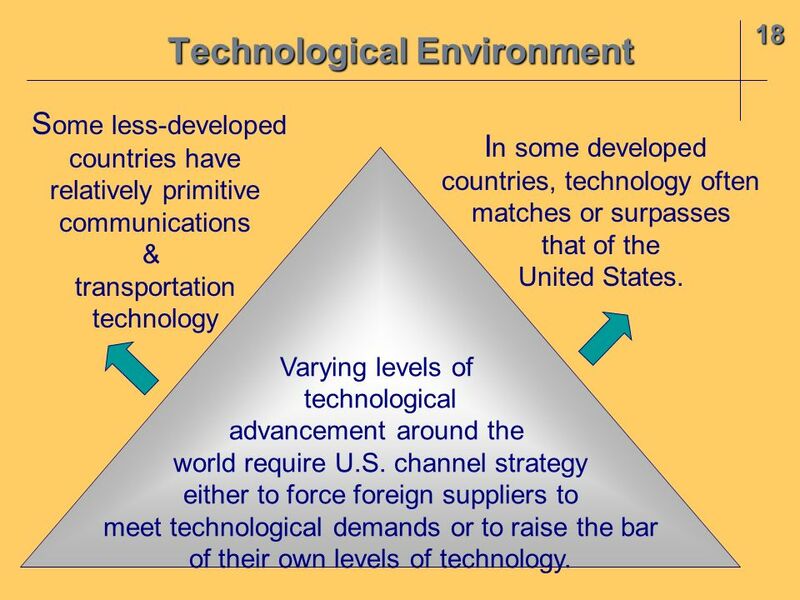 GLOBAL MARKETING The world is shrinking because of: faster communication transportation financial flows. 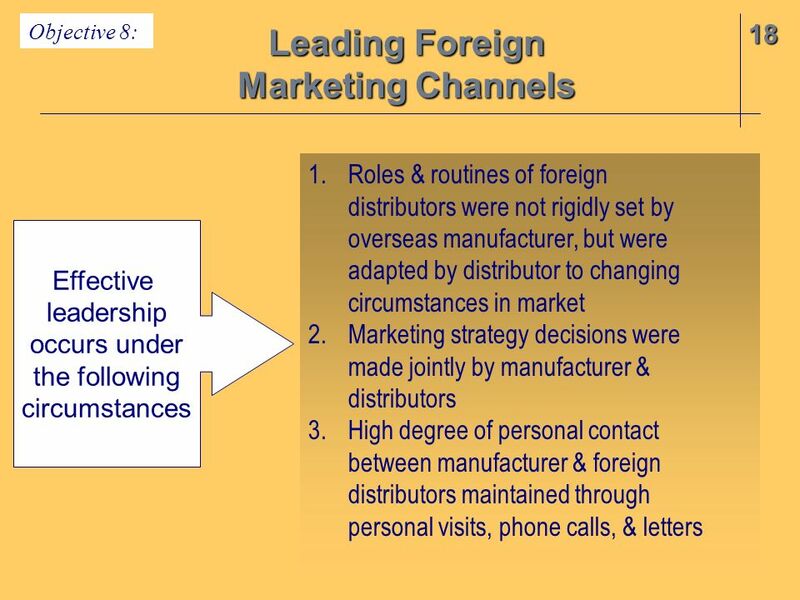 Copyright 1999 Prentice Hall 19-1 Chapter 19 The Global Marketplace PRINCIPLES OF MARKETING Eighth Edition Philip Kotler and Gary Armstrong. Global Market Entry Strategies. Copyright © Houghton Mifflin Company. All rights reserved. 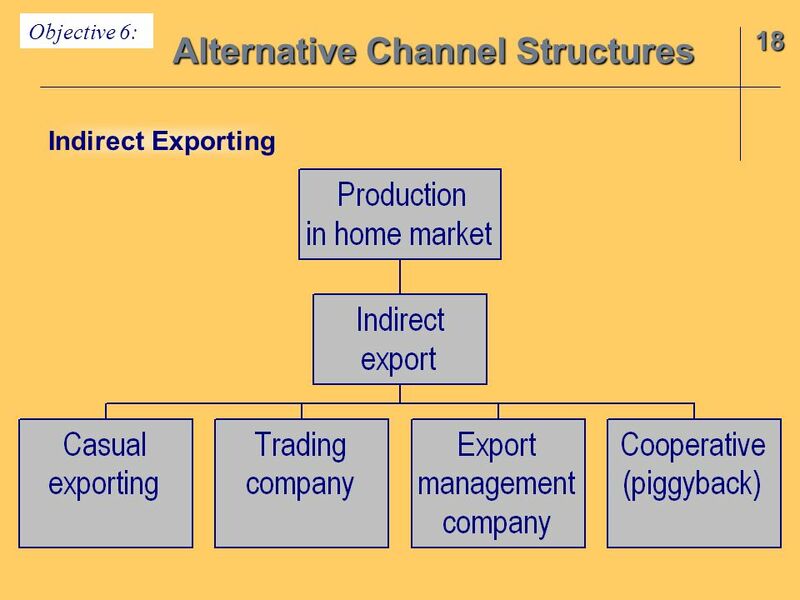 9-2 Discussion Outline Exporting as an entry strategy Exporting. 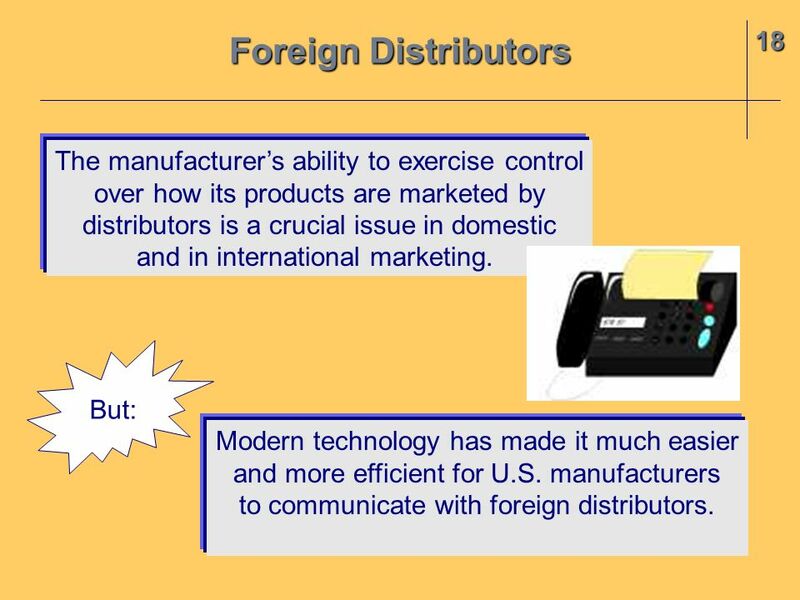 Chapter Four Multinationals and the Global Business System © 2007 The McGraw-Hill Companies, Inc., All Rights Reserved. 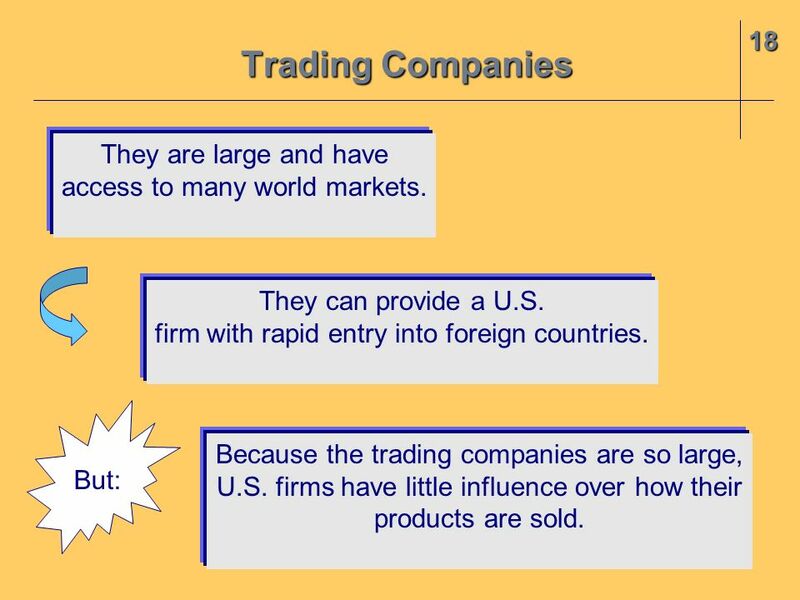 McGraw-Hill/Irwin Introduction. 9-1© 2006 by Nelson, a division of Thomson Canada Limited. International Strategy Chapter Nine. 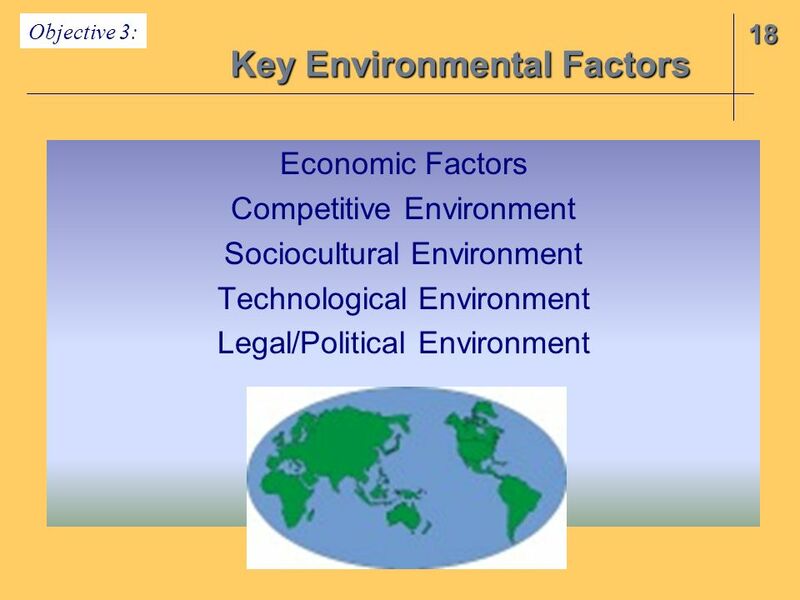 Managing in the Global Environment chapter six lecture 2 McGraw-Hill/Irwin Copyright © 2011 by The McGraw-Hill Companies, Inc. All rights reserved. 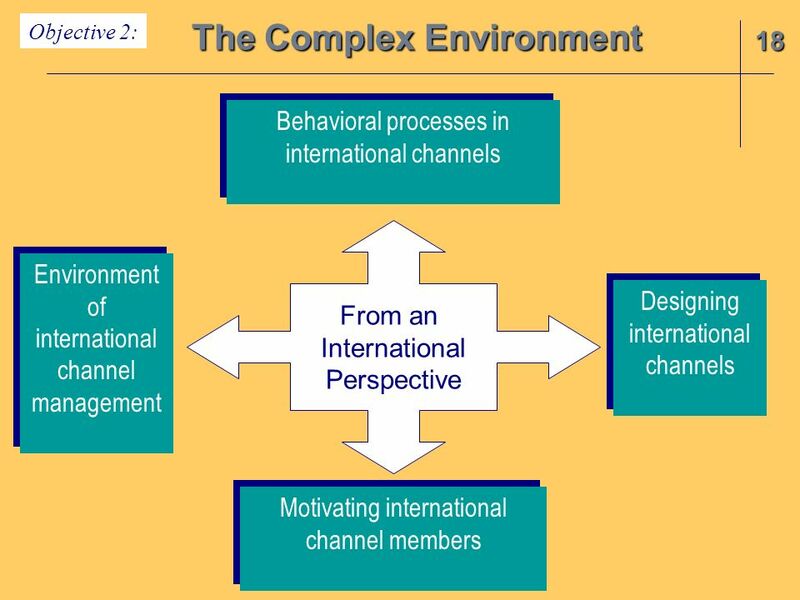 Distribution decisions in international context External factors Structure of distribution/channel Conflict & Control issues Managing logistics. Chapter Questions What factors should a company review before deciding to expand? 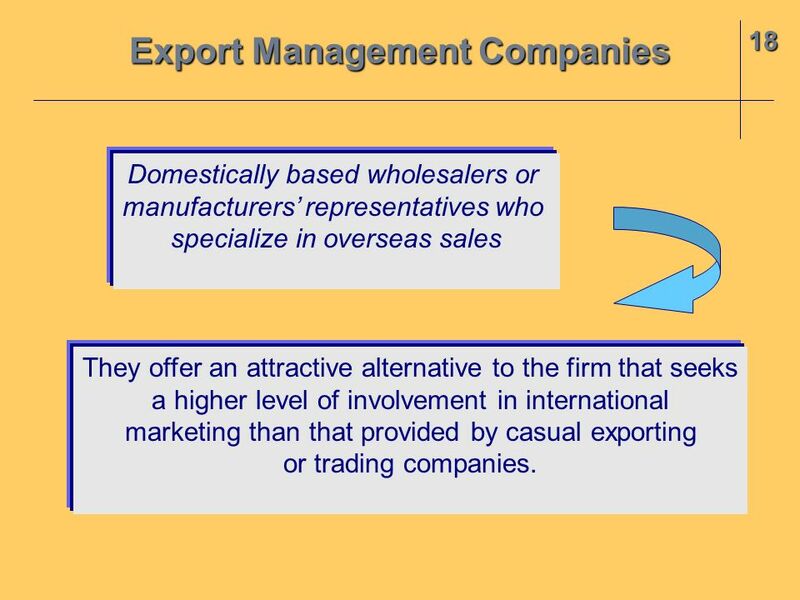 How can companies evaluate and select specific markets to enter? What. 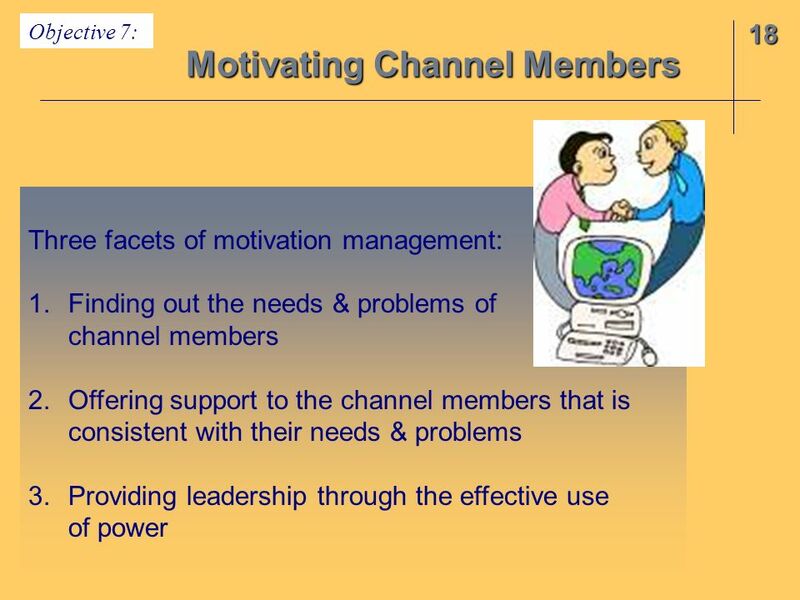 Developed by Cool Pictures and MultiMedia Presentations Copyright © 2004 by South-Western, a division of Thomson Learning, Inc. All rights reserved. Developed. 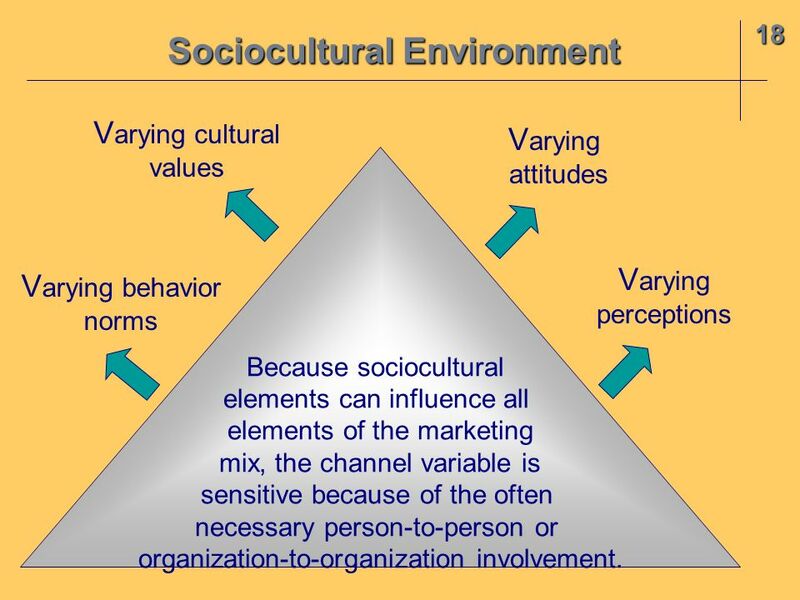 Principles of Marketing Lecture-41. 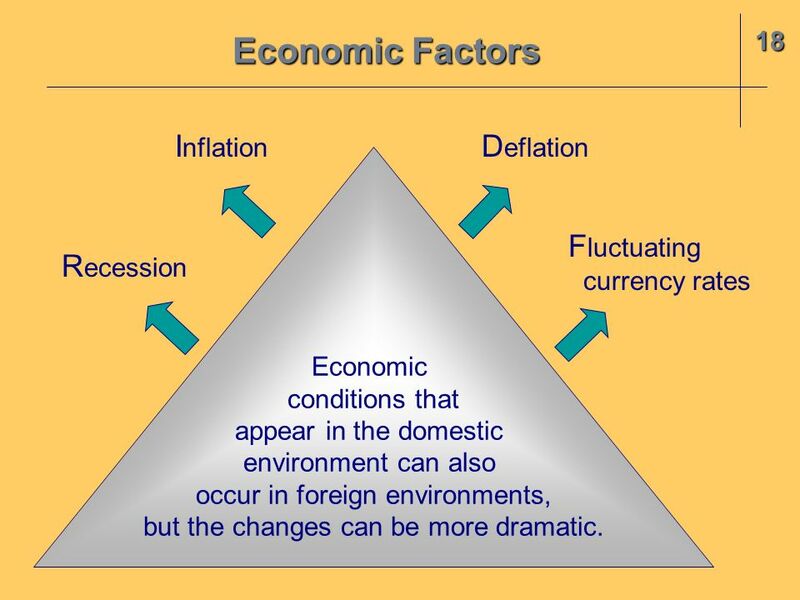 Summary of Lecture-40.